Because of my profession I don't talk about politics on social media or this blog. For those who don't know I'm the coanchor of a morning newscast. One of my duties is to update the station's website and social media pages. Last week I posted a story about Donald Trump and Hillary Clinton. Because I was crunched for time and couldn't create my own image of the candidates, I did a Google image search and found the one you see posted in this blog. I picked it because it's a professional looking photo and I thought it was the most flattering two shot of the nominees. But as I attached it to the story I had a gut feeling the photo would get comments. As usual, my gut was right. The photo got bashed from both sides. Liberal bias was cited because Trump appears to be scowling in the pic and we're just trying to make him look bad. Others complained we were clearly trying to make Hillary look bad because she appears to be smirking in the photo. However a majority of the comments were on the story at hand and not the picture. I guess the fact that both democrats and republicans were offended means we did our job correctly. So where'd I get the picture? Glad you asked. I don't know where it originated, but it was on a conservative website. 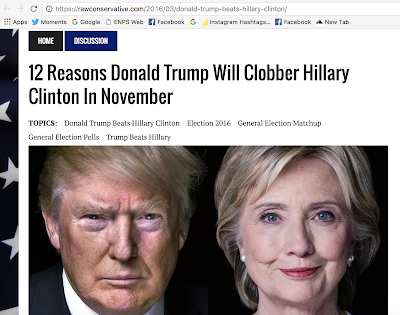 The article the photo is attached to is called 12 Reasons Donald Trump Will Clobber Hillary Clinton in November. I wonder if the folks at Raw Conservative caught flack for supporting Hillary with the photo. Editor's note: I do not know who I am voting for in November, nor have I ever let my beliefs dictate a story I've done. I know as I write this people have their minds made up and will believe what they want to believe. I feel better clearing the air on this less than picture perfect controversy.